A year ago, in anticipation of the celebration of the 500th anniversary of the Lutheran Reformation, initial plans were made for a large celebration in Milwaukee that would include conferences for all WELS called workers and a large festival worship service for called workers and WELS members in the 15,000- seat Bradley Center. After determining the huge cost of such an event, the decision was made not to hold the event as hoped but to encourage districts and regions to plan for local celebrations that would be less costly and enable more people to participate. Below is a slideshow of some of the special worship services and events held in our synod—both in the United States and around the world. To view more photos or contribute your own, check out the WELS Facebook page at fb.com/welslutherans. Watch for more photos and information about Reformation 500 celebrations in the January 2018 edition of Forward in Christ magazine. The bag weighed almost as much he did. But that didn’t stop a pastor from South Asia from hoisting the almost 100-pound bag of Multi-Language Publication booklets onto his back and walking for hours back to his hometown. What’s even more amazing is that in the past his church had been destroyed and he had been beaten and imprisoned for worshiping his Savior and sharing his faith with others. Seiltz conducted his first field visit of the area in September. 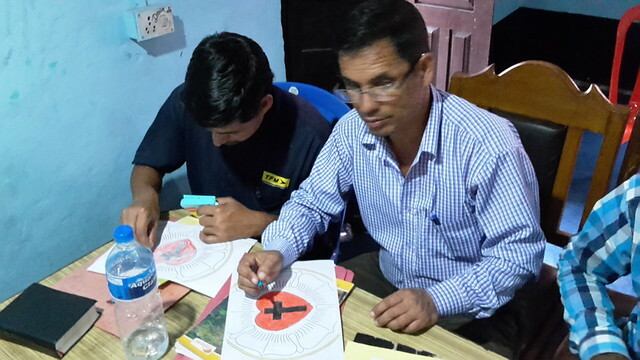 While there, he was able to help conduct a leadership workshop in which 75 men and women learned more about the prison epistles Philippians and Colossians, discussed the Lutheran Reformation, and went home with self-study booklets explaining Lutheran doctrine to distribute in their communities. This field in South Asia wouldn’t exist if not for these MLP publications. “Multi-Language Publications is the parent of these fields. It was a seed-sowing ministry and they planted so many seeds the church grew,” says WELS’ field coordinator for South Asia. “It’s a tremendous tool for our church in outreach and in discipleship training.” The church body in this area currently has 42 congregations and 14 seminary students. Seiltz visited South Asia after catastrophic flooding hit the region in August and September. While he didn’t visit any of the areas affected by the flooding, he says the leadership workshop was moved and delayed a day because the flooding delayed many of the workshop attendees who had to travel. WELS Christian Aid and Relief has granted almost $20,500 to provide flood relief in South Asia. Funds will be used to purchase and deliver supplies like mattresses, blankets, and mosquito netting to people in the affected areas. Our contact says providing this help gives the opportunity to show Christ’s love in action to the different communities. Learn more about Multi-Language Publications, which has printed more than 2.9 million items in 47 languages, at wels.net/mlp. Learn more about WELS Missions at wels.net/missions. “Joyful. Exciting. Amazing. A taste of heaven.” These are just some of the words used to describe the WELS National Choral Festival, which celebrates its 50th anniversary Nov. 10-12. More than 475 students from 22 area Lutheran high schools and preparatory schools will gather to sing their praises to the Lord in La Crosse, Wis.—the place where it all began. Dave Adickes, a teacher at Luther High School, Onalaska, Wis., invited eight WELS prep and high schools to sing in the first festival in 1967. Nearly 100 students gathered to “celebrate God’s gift of music” and get a “sneak peek of heaven” as well as gain exposure to a wide variety of directors and techniques, according to Adickes. From the beginning, Friday night’s concert was a secular concert performed by the individual choirs. Saturday was a day of rehearsal and fun, culminating with Sunday’s mass sacred concert. The location of Choral Festival changed as various WELS high schools hosted the event. As Choral Festival celebrates its 50th anniversary, Luther High School will again serve as host, this time under the direction of Dave Adickes’ son, Paul, a former Choral Festival attendee, director, and clinician. This year’s festival will include music from the past five decades, an almost 300-voice alumni choir, a 52-piece orchestra, and commissioned works by WELS teachers Sarah Siegler and Dale Witte—including the final piece, an arrangement of “God’s Word Is Our Great Heritage,” which also serves as this year’s theme. The image of the Mississippi River Bridge—an iconic feature in La Crosse—adorns the poster, symbolizing how “Choral Festival 2017 will bridge the music of the past, present, and future with the timeless heritage and hope that we have in the living and enduring Word of God,” says Paul. Choral Festival events will be streamed live. The pops concert is at 7 p.m., Nov. 10. The sacred concert is at 2 p.m., Nov. 12. Go to welsfinearts.org for more information. Check out more interviews with past and present Choral Festival directors and participants in a Forward in Christ extra. From police officers to those who are incarcerated, the Chaplain Certification Program is about helping people in special circumstances with special ministry needs. Training is open to all WELS members, both lay members and called workers, with a heart for meeting the spiritual needs of people in circumstances that require particular spiritual care. Specific areas of ministry include those in prison, hospitals, nursing homes, the military and their families, and public servants such as police officers and firemen and women. The Commission on Special Ministries has established a program for chaplain certification because many healthcare facilities, jails, prisons, and military bases are tightening their requirements for ministry in their facilities, especially if the pastor or layperson wants to reach out to non-members. Chaplain Certification Program courses can be taken online through Martin Luther College, New Ulm, Minn. There are four required courses – Communicating Forgiveness, A Scriptural Approach to Addiction Counseling, Your Chaplaincy and Ethical Issues, and Chaplaincy Seminary—and four electives with emphases on prison ministry, ministry to the military, and ministry to the aging. If you’re interested in becoming a chaplain, go to wels.net/chaplains. To enroll in training, visit mlc-wels.edu/continuing-education/wels-chaplain-certificate. The next online class, “The Spiritual Side of PTSD,” taught by Rev. Paul Ziemer, WELS national civilian chaplain to the military, will begin in January 2018; registration for the class is open until Dec. 22. A limited amount of financial aid is available from the Lutheran Military Support Group for WELS military contact pastors to take chaplain certification courses.